Tip	Ripe fruit will give a little with a gentle squeeze. Fat Goose Fruits have been certified organic* by NASAA (National Association for Sustainable Agriculture, Australia) who are Australia’s leading organic certification body and accredited by IFOAM (International Federation of Organic Agriculture Movements), the international umbrella group for organic agriculture. The role of these certification associations is to make sure integrity, transparency and an ethical approach are adopted when certifying organic growers. This ensures that only quality, genuinely organic products are released into the market for you to buy. By embracing the IFOAM Principles of Organic Agriculture, Fat Goose Fruits are constantly striving to improve the sustainability of our orchards and ecosystems, while providing you with naturally tasty, certified organic produce. Since the introduction of organic certification, we’ve been experimenting with a whole range of horticultural and sustainable agriculture methods. Some experiments succeeded… and others failed (providing plenty of valuable insight along the way). Over the years we’ve been working out how to do things better, in a more sustainable and cost-effective way. There have been many challenges such as drought and we’ve been mindful about using the valuable resource of the beautiful Murray River. We’ve been diligently working since 1994 to convert our orchards from a traditional horticultural model, to one that can be authentically certified organic. So far 75% of our orchards have been certified organic and our goal is to have the entire 23 hectares fully certified by 2016. 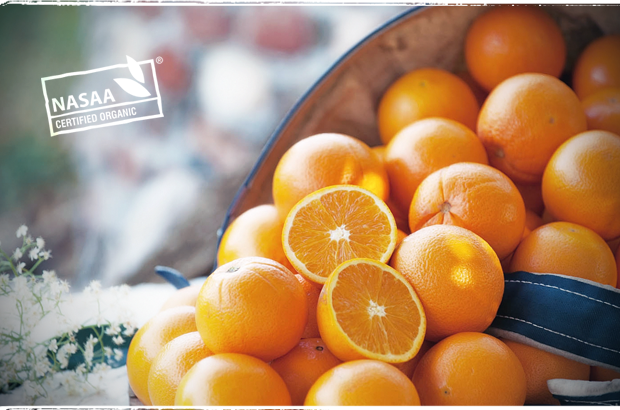 You can be assured that only fully certified organic produce is sold under the Fat Goose Fruits label, with our remaining produce going to conventional outlets. Find out where you can buy Fat Goose Fruits certified organic produce. Where can I buy? Our Orchard Practices	Why Grow Organic?